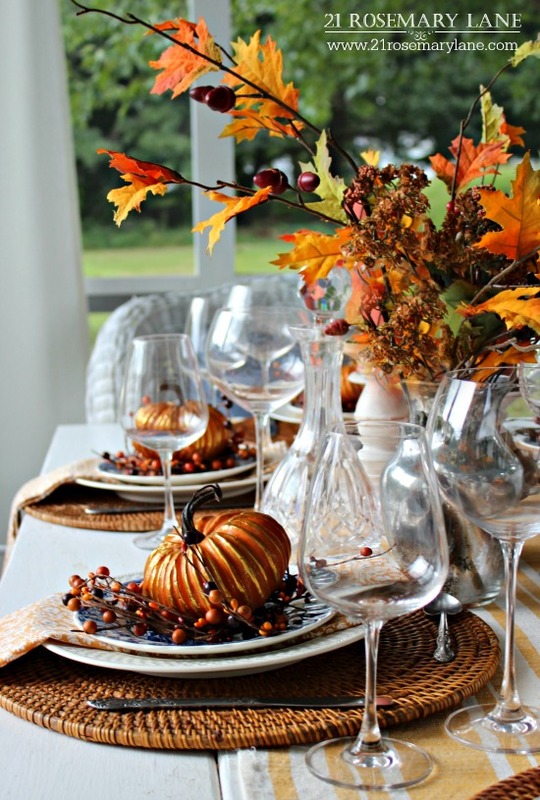 Despite today's 90 plus degree weather, I felt inspired to create an autumn tablescape on our back patio. To be honest the table setting started out in the dining room but I just wasn't feeling it, so outside it went! My "go to" colors for fall are blue and white with pops of orange. So classic! For the center of the tables I filled my DIY mercury glass vase with some artificial fall sprigs and then flanked the vase on one side with 3 pillar candles in a pumpkin orange! I know I will be much happier when this heat disappears and the cool Canadian air begins to move in. The only thing I rally don't enjoy are the days getting shorter, but soon it will be time to start "cozying up" in front of the fireplace and that is one of the things, for me at least, that certainly makes this time of the year my favorite. 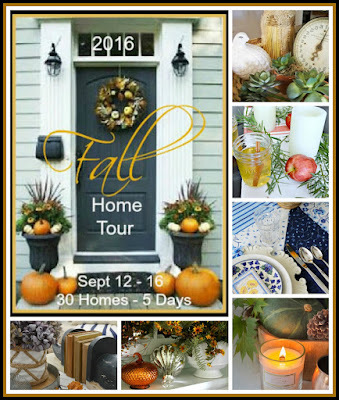 Don't forget that this coming Monday, September 12th, kicks off a week of Fall Home Tours, with 21 Rosemary Lane in day one's lineup! Have a wonderful weekend and see you on Monday!!! 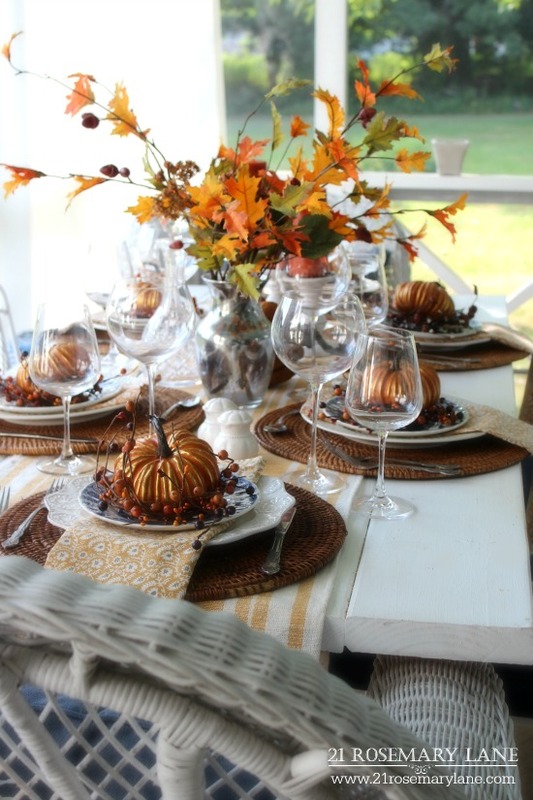 Barbara, your Fall table is gorgeous! 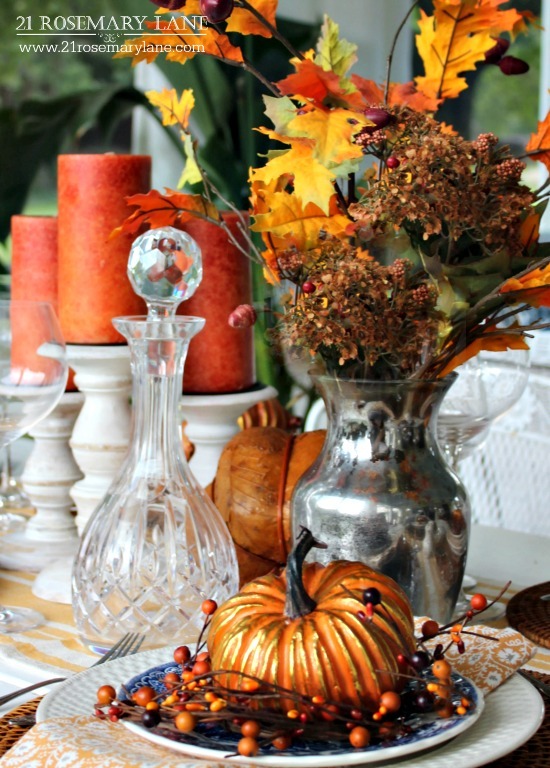 I love all the elements you have incorporated and your centerpiece is beautiful! I've been starting my Fall decorating this week, and I am so ready for cooler temperatures. I hope that you have wonderful weekend!!! 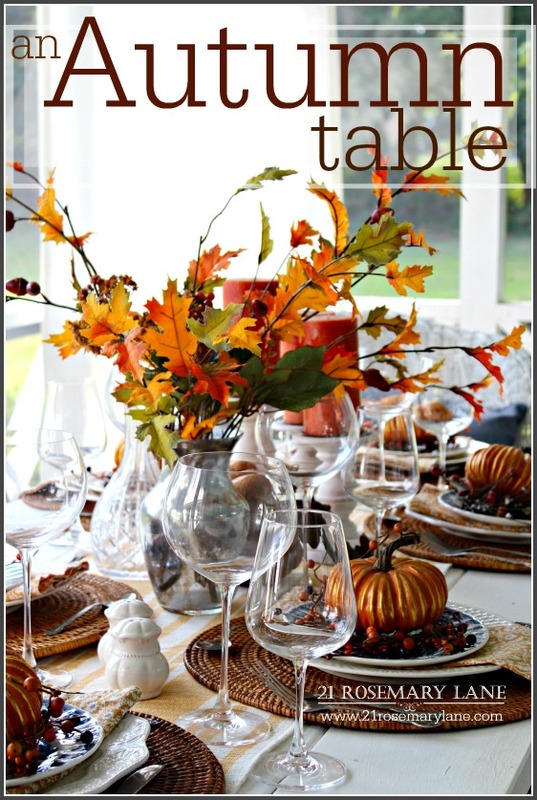 Love your tablescape, it looks amazing. Be sure to switch out Fox Hollow Cottage, she cancelled and put in Remodelando la Casa, she is filling the space. Very nice. I can almost feel a cool Fall breeze. It's in the 90's here too. I'm so envious when other people talk about it feeling like Fall. We have the endless Summer. Like you I decided to do something about it and hung my Fall wreath on the front door and put out a Fall flag. We can always pretend! 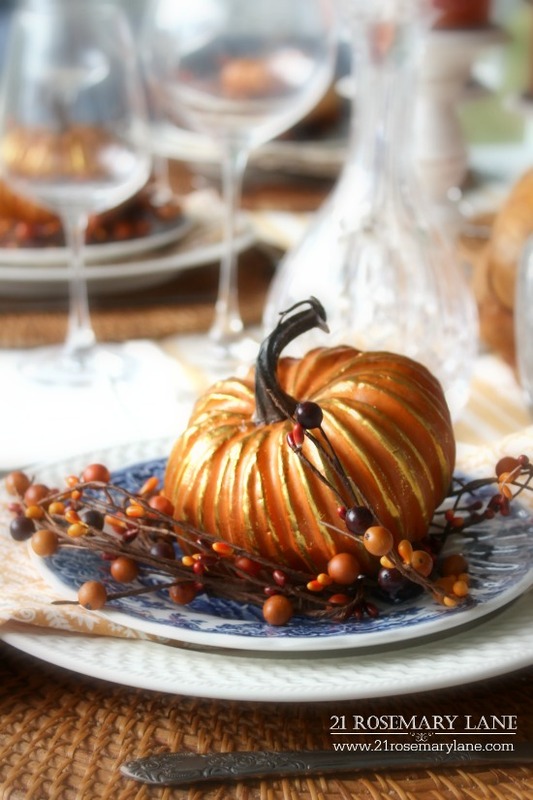 Timeless Classic blue & white are stunning when paired with the Autumnal leaves, bittersweet and pumpkins, dear friend! I adore all the texture and the light reflecting crystal! Perfect for the crisp air mornings I'm experiencing here on the Prairie! Barbara this is beautiful! Love the pretty pops of yellow and orange! 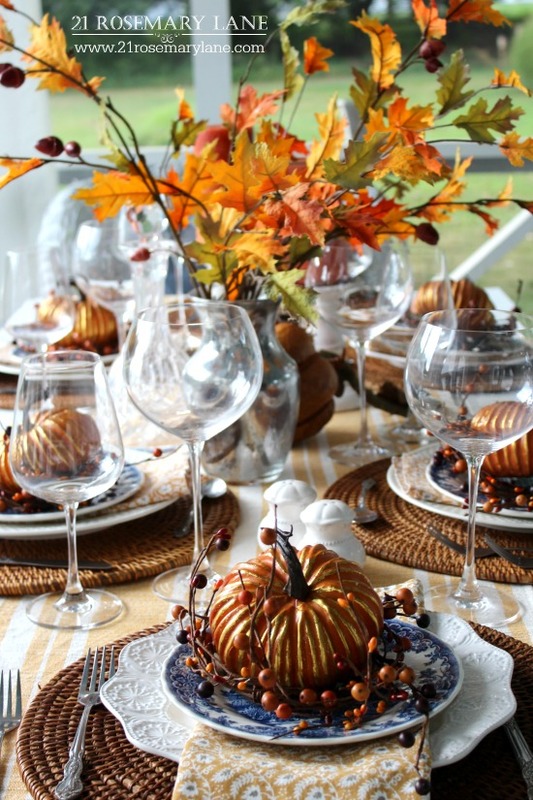 Your fall tablescape is stunning. You thought of every detail. Love the combination of blue with orange. 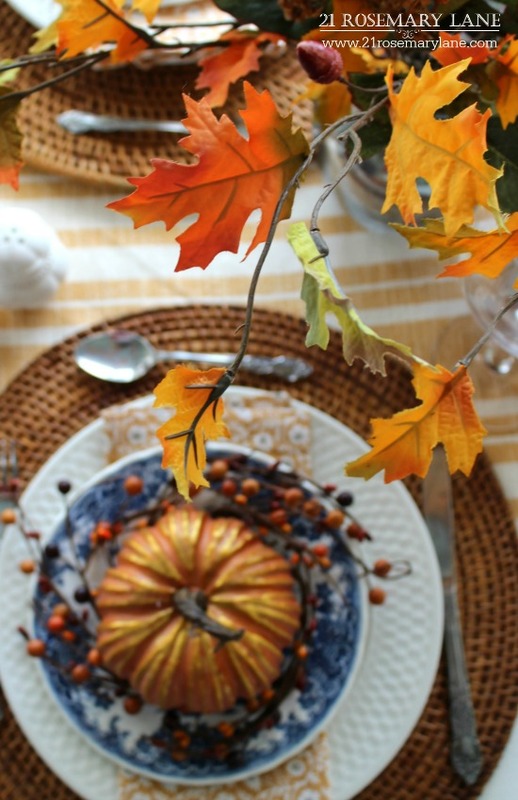 Popped over here from Peeking Thru the Sunflowers and your tablescape is so gorgeous! Love it and had to do some pinning!